So what does one accompany some tofu stir fry with? Rice is the go-to choice, of course, but that gets boring after a while. Let’s try something different. Let’s try soba noodles. 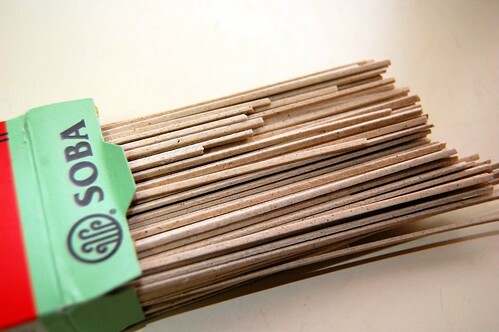 Soba’s a bit different from your regular pasta and is instead made from buckwheat (you give scientists enough time they’ll make noodles out of anything) and is used in a lot of cold dishes. I went the classic sesame and soy route, with a bit of spice. Try it out! I ended up using 1 – 1 1/2 teaspoon of hot bean paste rather than chili saucebecause I was out, but I think both would work fine. Boil the noodles in salted water per the instructions; probably 6-8 minutes. While the noodles are boiling mix all the remaining ingredients but the sesame seeds. When the noodles are ready, strain, transfer to a bowl and mix together the sauce one spoonful at a time until you get your desired sauciness. Serve (hot or cold), sprinkle with sesame seeds and enjoy. Thanks for the idea for the soba noodles! 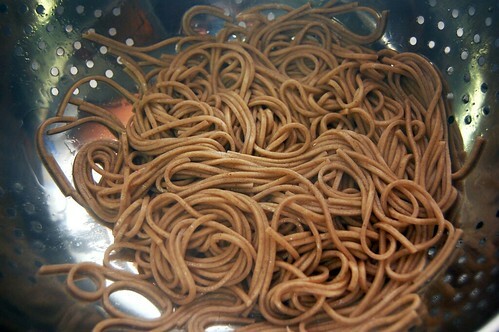 Speaking of making noodles out of anything, Wyylie Dufresne made noodles out of peanut butter using molecular gastronomy. But you’re right, get someone creative and give them the right tools and we can get noodles from anywhere. I love that! I also love using a vegetable peeler on zucchini to make noodles that way. Dress with a little lemon vinaigrette and serve. Easy peasie lemon squeezie. My sister introduced me to cold soba noodles and I love them. 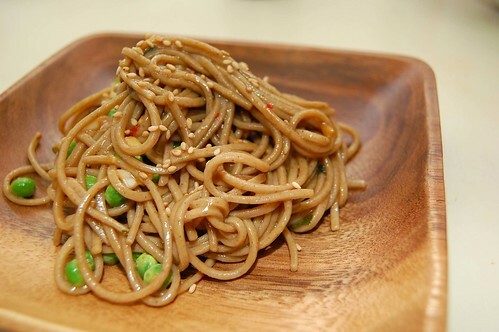 She used some peanut butter recipe, but it’s so easy to use yakisobi, or whatever that sauce is. Also, the peanut satay sauce from TJ’s is a great, easy mix.